When we’re young, we all have dreams about what we want to be when we grow up. Some of us proudly proclaimed we would be a doctor, a teacher, a firefighter, or the ever-popular rock star. Yet few of us grab hold of that vision and make it veracity. 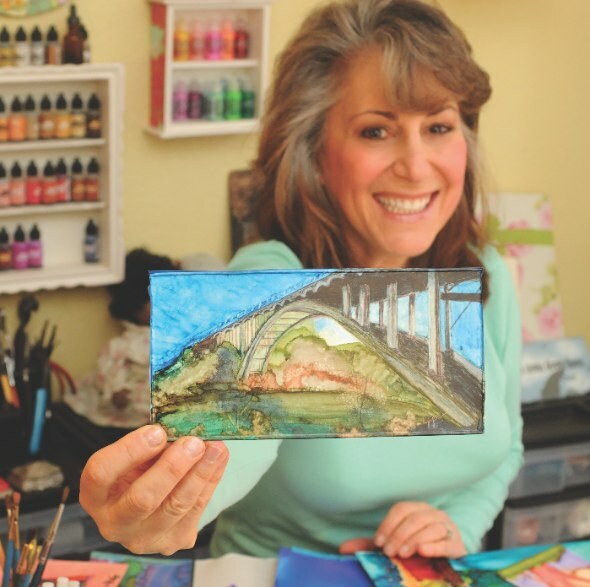 Having the bravery and passion to make her dream come true is only part of what makes Joyce Auteri, a mixed media artist from Folsom, truly exceptional. A California transplant by way of the East Coast, she followed her family to the Sacramento area in her early 20s. While her childhood was filled with wonderful opportunities to express her creativity, as with most people, the responsibilities of everyday life led her down a path of conventionality. After years spent in the telecom industry, Auteri came across a book called Taking Flight by Kelly Rae Roberts, which inspired her to get back to her artistic roots. Her initial approach was cautious, reintroducing herself to a variety of mediums until she found ink. Deciding to play with its uses, she grabbed some remnant tiles and let her imagination run wild. She presented the completed tiles to her friends via Facebook, without revealing they were her own work, and asked people what they thought. After a resounding response of excitement, she set her sights on having her own gallery space at Petra Vineyard Wine and Sutter Street Art Gallery. In June of 2012, the opportunity presented itself, and she jumped on it. Though Auteri doesn’t create her pieces in collections, they tend to comprise themselves into groupings. “I create intuitively,” she explains. “There’s no intention behind them.” But that doesn’t mean they are wholly abstract works. Instead, Auteri allows the color and form to dictate what they will become. Her paintings often morph into a distinct image during the creative process. “Until they speak to me, they’re just colors,” she says. Visit joyceauteri.com for more information.